It appears that the accounting cycle is completed by capturing transaction and event information and moving it through an orderly process that results in the production of useful financial statements. Importantly, one is left with substantial records that document each transaction (the journal) and each account’s activity (the ledger). 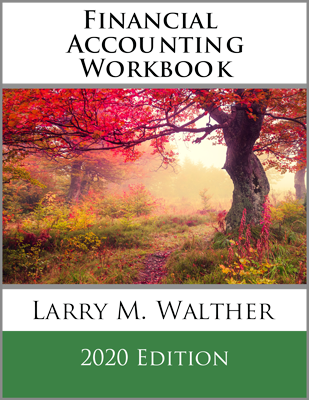 It is no wonder that the basic elements of this accounting methodology have endured for hundreds of years. 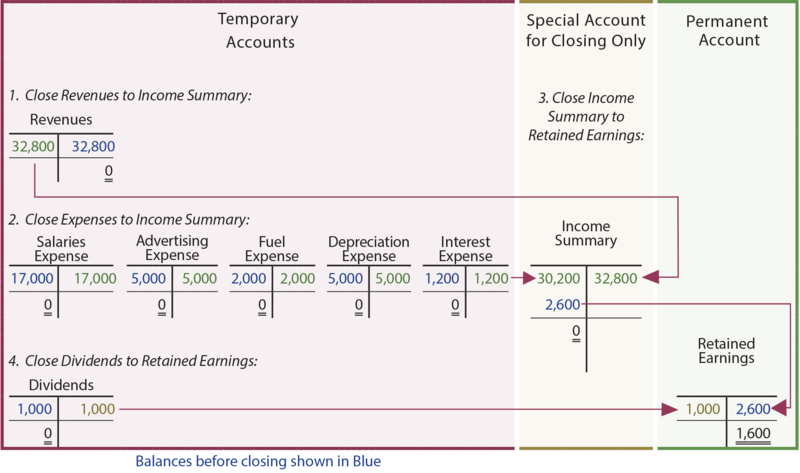 Closing is a mechanism to update the Retained Earnings account in the ledger to equal the end-of-period balance. 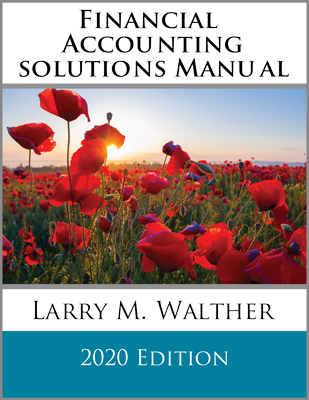 Keep in mind that the recording of revenues, expenses, and dividends do not automatically produce an updating debit or credit to Retained Earnings. As such, the beginning- of-period retained earnings amount remains in the ledger until the closing process “updates” the Retained Earnings account for the impact of the period’s operations. Revenues, expenses, and dividends represent amounts for a period of time; one must “zero out” these accounts at the end of each period (as a result, revenue, expense, and dividend accounts are called temporary or nominal accounts). In essence, by zeroing out these accounts, they are reset to begin the next accounting period. In contrast, asset, liability, and equity accounts are called real accounts, as their balances are carried forward from period to period. For example, one does not “start over” each period reaccumulating assets like cash and so on; their balances carry forward. This process results in all revenues and expenses being “corralled” in Income Summary (the net of which represents the income or loss for the period). 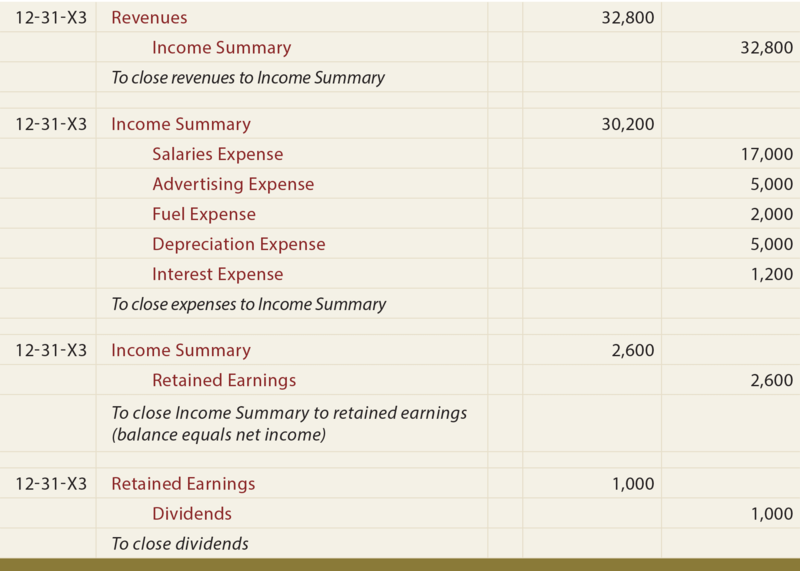 In turn, the income or loss is then swept to Retained Earnings along with the dividends. 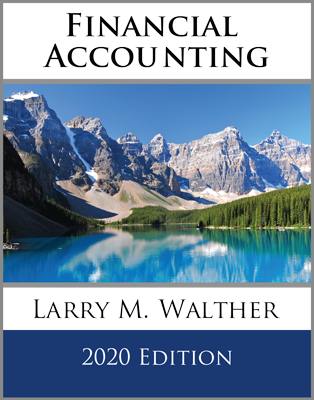 Recall that beginning retained earnings, plus income, less dividends, equals ending retained earnings; likewise, the closing process updates the beginning retained earnings to move forward to the end-of-period balance. The post closing trial balance reveals the balance of accounts after the closing process, and consists of balance sheet accounts only. The post-closing trial balance is a tool to demonstrate that accounts are in balance; it is not a formal financial statement. All of the revenue, expense, and dividend accounts were zeroed away via closing, and do not appear in the post-closing trial balance. Many accounting software programs are based on database logic. These powerful tools allow the user to query with few restrictions. As such, one could request financial results for most any period of time (e.g., the 45 days ending October 15, 20XX), even if it related to a period several years ago. In these cases, the notion of closing the accounts becomes far less relevant. Very simply, the computer can mine all transaction data and pull out the accounts and amounts that relate to virtually any requested interval of time. Articulate the steps in a the accounting cycle process. Define temporary (nominal) and real accounts. Be able to prepare closing entries related to revenues, expenses, the Income Summary, and the Dividend account. 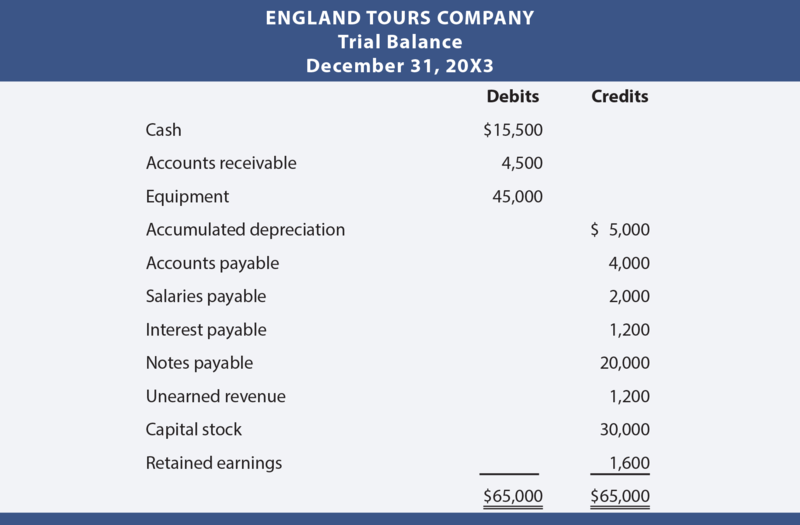 What benefit is a post-closing trial balance, and what type of accounts would be found there?